Home / Resources / Locks & Keys / Will a Locksmith Copy a “Do Not Duplicate” Key? Have you ever needed to copy a key, but noticed the “DO NOT DUPLICATE” inscription on it? You probably wondered if it is illegal to duplicate the key. The truth is there’s no law regarding “do not duplicate” keys. The engraved message found on many business keys is not legally binding – it’s just a recommendation. Though many chain hardware stores, such as Ace, may refuse to cut a copy of these keys, a locksmith can easily duplicate them. Property owners and managers began pressing the “do not duplicate” key message in an attempt to control security violations from terminated employees, former tenants, construction workers and others who gain possession of a key. Unauthorized key duplication remains a serious threat to security today and is currently the single most violated security policy in business. The inscription may decrease the number of copies in circulation because of the need to have them copied by a locksmith. Yet the fact remains that keys stamped with “Do Not Duplicate” are no more secure than keys without it. According to the Associated Locksmiths of America (ALOA), having a “do not duplicate” message inscribed on your company keys may actually provide a false sense of security. 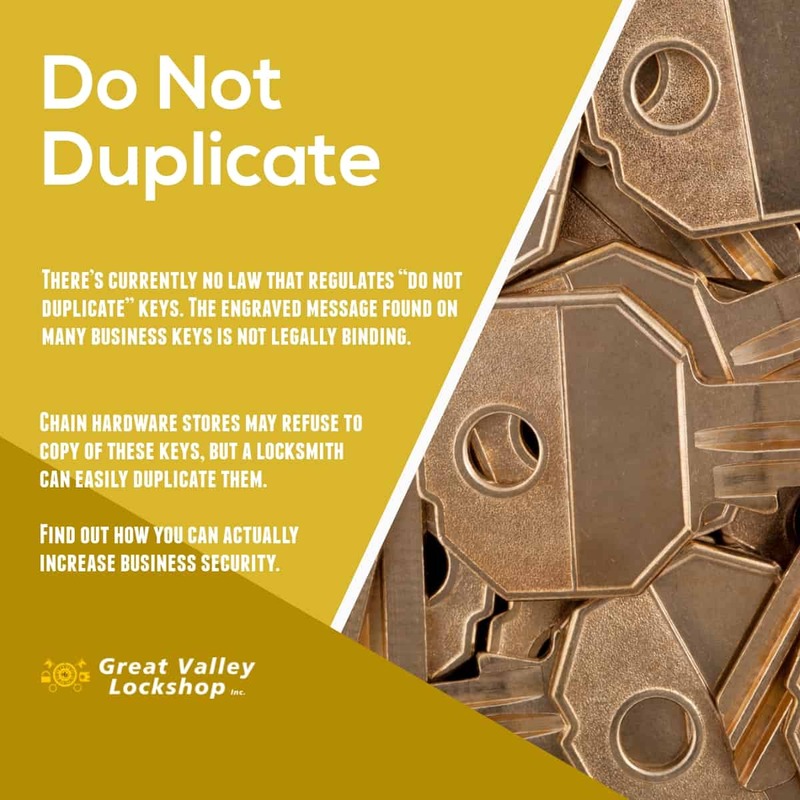 Because keys labeled “Do Not Duplicate” can actually be copied, your business will need real solutions to successfully increase security. The good news is that there are some other types of keys available that can help ensure the security of your business. It is illegal to duplicate some keys. Locksmiths refer to these keys as “restricted,” meaning that duplication rights are limited to the key’s original manufacturer. In order to make some of their products more secure, lock makers have made restricted keys which are harder to copy because the process requires special equipment and because the key design is patent protected. Restricted keys are covered by U.S. patent laws which protect manufacturers of specialized lock and key systems. There can be a penalty of up to $10,000 imparted for circumventing the law, including the illegal duplication of restricted keys. Duplication of restricted keys is limited to approved manufacturers and locksmiths and requires the use of particular tools. In order to have a copied made, the locksmith should ask for identification of the person requesting it and proof that this person has obtained permission from the original owner. These keys provide a higher level of security than unrestricted keys, even those stamped “do not duplicate”, because they are more difficult to copy. For businesses aiming to control the number of copies available, a restricted key may be the right choice. If you suspect that duplicate keys are undermining the security of your organization, consider asking a qualified locksmith to rekey the locks on the property. During rekeying, the locksmith changes the internal mechanism that accepts the keys, making it impossible for the previous keys to work and open the lock. Another way to provide extra protection for a commercial property is to invest in locks that are designed to be more difficult to pick. Some manufacturers produce locks with tight tolerances or with additional pins or special features on the pins – including dimples and angles. Locks should also be made of high-strength materials to prevent burglars or vandals from drilling them or breaking them with force. Check with the manufacturer if you are unsure of what your locks are made of or how they are designed. For superior security, it’s recommended to implement a technological solution, such as smart electronic locks. These are special devices that allow you to lock, unlock doors, program the security system and even monitor traffic in and out of the building – all from your smartphone. Another great option is electronic access control systems; key card systems allow businesses to restrict certain areas or terminate access to some without needing to reissue cards for other employees. Check out these additional tips on business security measures. Your local locksmith can duplicate all types of keys and make key copies that work perfectly. A skilled locksmith can also provide you with the information, locks and keys to safeguard your commercial property from unwanted intruders. Great Valley Lockshop can help. For service, contact us at (610) 644-5334 or fill out our online request a quote form. Ask us about “Do not duplicate” keys, restricted keys and electronic security systems to protect your business.